Marty Gibson is a living example of the word “selfless.” Marty has lived his life helping and thinking of others. At Longwood, Marty is constantly helping other students and faculty in more ways than most can imagine. He uses past experiences to spread his wisdom to the younger generation. Marty Gibson is the kind of man to set aside all of his own worries to help someone me may not even know. Through his faith in God, Marty serves as a role model to Longwood’s campus. Marty went to college at the University of Tennessee on scholarship for wrestling. Marty was a very successful wrestler and made his way up to the national level for his school’s division. While wrestling for his university, Marty was preparing to wrestle in the Olympics. Marty would wake up before classes to run 10 miles, go to weight training, go to classes, run 5 more miles, and then go to wrestling practice. Marty started wrestling at the age of 6 and was now at the age of 19 and was ready to move onto the next step of his career. Leading up to the trials, Marty had been on a winning streak but lost to one man named Gonzales with a score of 25-6. With a crushing defeat, Marty decided to leave wrestling as he would not be continuing to the Olympics. Marty gave wrestling his all but feels as though he could not offer the sport much more. Looking back, Marty said, “I do not feel bad about saying I lost to the guy that went on to become the best in the world.” Leaving wrestling was a hard decision, Marty had to give up his scholarships and the sport he played for 13 years. Nevertheless, Marty was burnt out and ready for something new. After quitting, Marty was finally able to join a fraternity, get a girlfriends, and focus on his studies. Marty ended up leaving the University of Tennessee after his sophomore year and began attending community college. Marty began working for a helicopter company. The job was dangerous but fun. Marty left the helicopter business in search of a new job or career. Marty went to a headhunter in Lynchburg, Virginia. They were a company that helped people search for jobs. Marty agreed to terms with the headhunter that once he accepted a job that they helped him find, Marty would pay them 10% of his first year salary. Marty was offered three jobs through the company but accepted a position with Marriott International as a Hotel and Restaurant Manager in Washington D.C. Once accepting the position, Marty then owed the headhunter $4,000. Marty did not have much money and was unable to pay the headhunter. Marty went to the bank to request a loan. The banker was hesitant at first but granted the money as Marty was a loyal customer with a great credit score. Marty now had the money he needed and was on his was to Washington D.C.
Marty worked for Marriott for two years and reportedly loved the experience. As a small town boy, the big city life was a very foreign feel. Although he enjoyed the job, he did not enjoy the city. Marty did not like the dangers that came along with Washington D.C. at that time. Marty claimed he had both guns and knives pulled on him and he also fell into other dangerous situations. While on vacation back to his hometown for Thanksgiving, Marty got a taste of his former life in a small town. He recalled feeling as though he did not want to return to Washington. While Marty was driving back to his job, his truck broke down. When he was at the repair shop, Marty called his dad. He told his dad how he did not want to return to Washington. Marty made the decision to leave the job and return home for good. Marty’s boss’ in Marriott expressed their understanding but also assured Marty he would always have a job offer with Marriott. Returning home, Marty took a job painting his grandmother’s house. The company his grandmother was going to hire was going to charge her $5,000. Marty offered to do it for $500. The large upcharge from the painting company inspired Marty to start his own painting company and charge a fair price. Marty’s painting business took-off and he became very successful. As a business owner, Marty was able to show his heart better than ever before. He began to hire people who have had a hard time getting hired including those who have been in jail. Marty said he hired people who would have never had another opportunity for a second chance at life. The reason he hired these people is because of his faith in God. Marty has a forgiving heart and wanted to give people the chance to make good of their life. Marty built a successful business profiting in the millions. While running the business, Marty landed a job painting on Longwood University’s campus. After the job, Marty was offered a job with Longwood. He decided to take it and he has been at Longwood ever since. Over the last 17 years, Marty has served and influenced Longwood University in countless ways. Marty was originally hired to work for facilities. Marty began his career at Longwood working for the facilities department, repairing broken things on the campus. 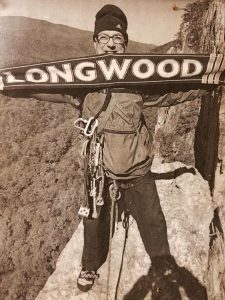 He stated his belief that he was brought to Longwood for a reason. He was brought to the university to affect student’s lives. As the years progressed, Marty became Longwood’s “fix-it man.” Marty would go to student’s rooms to complete work orders and he would have meaningful conversations with students. Marty would not only go to work to complete his tasks for the day, he would also make a point of impacting someone’s life that day. 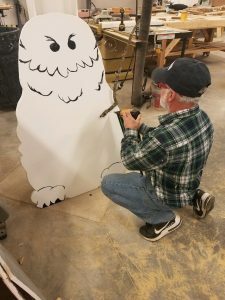 Marty Gibson voluntarily making a snowman from a children’s book for a parade in Farmville, Virginia. Many years would go by for Marty working in facilities before he would change to a new focus on campus. Marty left facilities and reopened the woodshop in Bedford hall. Ever since, Marty has still been able to call himself Longwood’s “fix-it” man. Marty claimed, “There is not one place on this campus I have not worked on.” From working on many places around campus, he also builds relationships with students that last a lifetime. Marty acts as the shopkeeper for the woodshop class offered in Spring. Through teaching the class, Marty became close with many of the students as the students would spend a lot of time in the woodshop working on projects. Some students still go back to visit Marty, even after completing the class. One student, Dalton Rudd claims to visit Marty two or three times a week. When asked to describe Marty, Rudd stated, “At first he is very high energy and takes control. He is very extroverted and likes to talk to people and establish relationships. He does not always care about completing the project as much as he cares more about creating a relationship.” Making long lasting relationships with students is a very important thing for Marty. Marty also establishes close relationships with faculty. One of Marty’s best friends, Donald Kelleum, is a plumber at Longwood. Kelleum helps maintain all the fountains on the campus. Kelleum stated he has worked with and been friends with Marty for over 10 years. Kelleum continued to state, “Marty is a good guy. He would take the shirt off his back for just about anybody. He is always available to help anybody. I have never seen him not help someone. If anyone ever needs a hand, he is there to help.” Through his relationship with students and faculty, no relationship is more important than his marriage with the love of his life. Marty has been married to Karin Warner for over 30 years. Karin is a manager of third party programs/receivables. Karin met Marty when she was working at 7eleven. Marty would come into the store as a customer. After seeing Marty for a while, they became friends and fell in love. Karin claimed, “We got to know each other as friends, instead of jumping into dating.” Karin expressed Marty’s good nature and big heart for other people. Marty Gibson is Longwood University’s greatest asset. It is rare to find someone who is so willing to leave his personal matters to help other faculty and students. Marty seeks to help others without wanting recognition for his help. He is a genuine man that wants the best for others. Marty is a unique person that has changed the lives of countless people. Clean WordPress Themes The Universal Man Copyright © 2019.